On the last Friday in July 2018, a car with speakers mounted on the roof pulled up to the TEPCO headquarters near Hibiya Park. At a little past 5pm, the utility’s employees began streaming out of the building and, as they glided through the automatic doors, recognition flashed over their faces. As they turned toward the Shinbashi nightlife district, the office workers shot sour looks at the man in the blue-and-yellow sash, who stood in front of the car. “You should take responsibility. How can you just walk by? You are polluting Fukushima’s waters,” he yelled into a microphone, blasting the company for its actions since the triple meltdowns at the Fukushima Daiichi nuclear power plant. Masami Yoshizawa was running for mayor of Namie, one of the seven cities, towns and villages surrounding the damaged power plant that remain under partial evacuation orders. As part of his campaign, he’d come to TEPCO to deliver a letter outlining his plans to take the company to court for damages and to demand the utility cancel plans to release tons of radiation-contaminated water into the Pacific. Yoshizawa had spoken in front of the headquarters before. The first time was in the days following the earthquake and tsunami on March 11, 2011. Back then, he’d held out as long as he could on his ranch, 14 kilometers from the power plant. Once it became clear that his herd of 328 Japanese beef cows had lost all their value — the animals had been worth over ¥450 million before they were exposed to the radiation released from the plant — he decided to go to Tokyo to make his voice heard. After driving down, he walked into the scrum of police and news vans that surrounded the TEPCO headquarters and demanded to speak with someone from the company. Though the police seized him by the arms, he didn’t give up until a representative from the utility eventually agreed to listen to his complaint. After returning to Fukushima, he started visiting his ranch to feed his animals, unwilling to let them starve. Eventually, he decided to ignore the mandatory evacuation order and began living on his land again. In his youth, he’d been part of the Japanese student movement and this experience informed him as he poured his energy into the anti-nuclear campaign: he hauled his irradiated cattle down to the Ministry of Agriculture and made impassioned speeches in Shibuya and Sendai, attempting to raise awareness of the plight of farmers and ranchers around Fukushima Daiichi. His land, which he renamed the Ranch of Hope, became a hub for activists and environmentally-minded volunteers, who came to support him and help take care of the cows. Then in June of this year, Tamotsu Baba, Namie’s three-term mayor, resigned. He had stomach cancer and, two weeks after stepping down, he passed away in a hospital in Fukushima City. A special election was scheduled for August 5 and Yoshizawa declared his intention to run. In some ways, Yoshizawa’s policy positions were less important than his stance toward the recovery effort. Of the 17,791 officially registered residents, only 777 have returned to live in the few dozen square kilometers where the evacuation order has been lifted; thus, being mayor of Namie effectively means being the leader of a town that exists mostly on paper. More than anything, the election was a way of gauging the mood of the voters, most of whom had been evacuated from their home for over seven years. The following day, Yoshizawa campaigned in his home prefecture. After the evacuation, Namie’s residents had been dispersed across the prefecture, with the bulk winding up in Fukushima City, Nihonmatsu, Koriyama and Minamisoma. Evacuees initially lived in hastily constructed temporary housing, but facing the prolonged recovery effort ahead, the prefectural government built “recovery homes” — apartments and blocks of single-family houses — and is now moving the nuclear refugees into these units. Late in the afternoon, Yoshizawa’s car pulled up to a series of oblong three-story buildings. He stepped out, placed a plastic milk crate upside-down on the sidewalk, and stood on it as he launched into his stump speech. Three volunteers working for his campaign watched for anyone who stepped outside to listen to him or who happened to be crossing the parking lot as he spoke. If they spotted a potential voter, the volunteers sprinted to them — even if this involved several flights of stairs — and handed them a flyer, asking for their vote. As Yoshizawa’s rhetoric echoed through one corner of the apartment complex, a white van pulled up to the opposite corner, and a man with a bullhorn got out. Kazuhiro Yoshida had been the head of the former mayor’s support group and was Yoshizawa’s only opponent in the election. Like Yoshizawa, he was deeply tanned, with rough features and a straightforward manner. But unlike his rival, Yoshida’s message was one of continuity: the handpicked successor of the previous mayor, with connections to the ruling Liberal Democratic Party, he promised to press forward with the recovery plans, such as they were. He spoke optimistically about reconstructing Namie and rebuilding a local economy based on agriculture and fishing. Yoshida’s quasi-incumbent status was confirmed by the sparse nature of his campaign. He had no flyers or banners, not even a business card to hand out to inquiring media-types. No volunteers flanked him, and, if you removed the references to disaster and recovery, his policy proposals could’ve been meant for any struggling town in Tohoku: create a safe and secure environment, support the elderly and so on. These contrasts were not lost on the handful of voters who spilled out of the apartment blocks to listen to campaign speeches. One former store owner in her 60s planned on voting for Yoshida, and was realistic about the future: “I think I won’t ever go back… Still, I want them to make a town where it’s easy to live again.” A middle-aged man from the coastal district of Ukedo said his vote wasn’t decided, but that the most important thing for him was stability. Yoshizawa’s volunteers were a collection of journalists, animal lovers and activists. The campaign was a kind of traveling, temporary family, and, as with any middle-class Japanese household, lunchtime was likely to find them in a family restaurant, as was the case two days before the election, when they stopped at a tonkatsu (fried pork cutlet) place in a residential neighborhood of Koriyama. Originally from Osaka, she had never volunteered until the Kumamoto earthquake damaged her grandmother’s house. After her first experience, she wanted to do more to help, but Kyushu was too far. She had always loved animals — a quality which helped her connect with pet-owning voters — and the chance to be close to the cattle led her to the Ranch of Hope. On this point, Ohamazaki proved right, as 43 percent of residents went to the polls. However, the result of the election would fall against his client, with 80 percent of voters opting for the stability offered by Kazuhiro Yoshida. Despite all they’ve been through (or perhaps because of it) Namie’s voters weren’t interested in a new, more confrontational approach. In some ways, the story of this mayoral election in the exclusion zone, echoes one of the problems facing the Japanese political left as a whole: an inability to show voters — even those who are disenchanted with the status quo — how a narrative of resistance and change will impact their lives for the better. In the weeks since the election, Masami Yoshizawa has returned to his ranch, where he herds his irradiated cattle over the green hills of Fukushima. Namie Town heads into its eighth year of recovery, its future suspended in uncertainty, with no end in sight. The Parliamentary Assembly of the Council of Europe (PACE) expressed on Thursday deep concern at the construction of the Akkuyu nuclear power plant in an earthquake-prone region of Turkey only 85 kilometres from the border with Cyprus. In a resolution it adopted, the assembly said that Turkey’s first nuclear plant being constructed as a joint Turkish-Russian project is in very close proximity to the other neighbouring countries. The assembly asked Turkey to join the UN Convention on Environmental Impact Assessment in a Transboundary Context, also known as the Espoo Convention, and to take into account all concerns expressed, including those expressed by Turkish citizens. The assembly also requested from the Turkish government to consult with neighbouring countries on the construction of the nuclear plant according to the International Convention on Nuclear Safety. The nuclear plant “raises concerns for a possible impact in terms of safety because such a power plant in this area affects our country much more than the largest part of the Turkish territory,” said the Cypriot government’s spokesman Prodromos Prodromou, following the groundbreaking ceremony in Mersin. “Turkey did not take into account the grave reservations expressed by various quarters, nor did it heed the European Parliament’s call to terminate the construction plans since this is a seismologically vulnerable area,” he said. 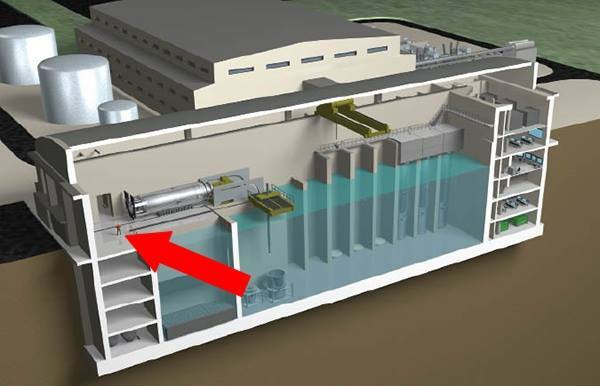 Small Modular Reactors don’t exist yet, and the picture below shows that the size of these speculative reactors are far from “small” (red arrow points to tiny human figure). Yet Barry Brook continues to receive funding from the “Australian Research Council” to investigate all things nuclear, including putting these reactors on small islands. How much money has gone to funding pro-nuclear fantasy research? Noel Wauchope they are now referred to by IAEA as small and medium reactors (SMRs)…..A subcategory of very small reactors – vSMRs – is proposed for units under about 15 MWe, especially for remote communities……..Note that many of the designs described are not yet actually taking shape. ……. There’s a bewildering array of reactor designs, listed in MWe (MegaWatts electic) -not in physical size. By SIMON OSBORNE, Express UK, Oct 11, 2018 Moscow’s Deputy Foreign Minister Sergei Ryabkov described Western governments as “adversaries, not friends” and said a “complete malfunction of the American system” meant longstanding weapons agreements could be binned, leaving nuclear powers without constraint in the event of a future conflict. Mr Rybakov warned another round of sanctions intruded by Donald Trump in the summer were “dangerous” and getting in the way of negotiations over renewing the New Strategic Arms Reduction Treaty “New START” which saw both sides agree to reduce their deployed nuclear arms by half but is set to expire in 2021.
off Penarth to continue uninterrupted . demonstrators who were addressed by the leader of Plaid Cymru Adam Price. – was quashed by the Labour Party. Minister Lesley Griffiths – a former personal secretary . Twenty days after Saudi Arabia and the United Arab Emirates (UAE) bombed a school bus full of children in Yemen this August, Defense Secretary James N. Mattis hosted officials from the two US allies at the Pentagon. They were all gathered as part of a meeting of representatives from the Gulf Cooperation Council, at which Mattis thanked them for their “regional leadership and years of close cooperation with the United States.”…….. In this war, the Saudi and Emirati militaries are dropping the bombs, and the United States plays a critical role in every step of the operations. The coalition’s munitions are made in the US, as are the planes dropping them — all of which were sold to Saudi Arabia and the UAE in deals brokered by the US government. …….. It is remarkable that — despite the international spotlight on the war in Yemen resulting from the highly publicized school bus bombing — Trump administration officials continue to embrace Saudi Arabia, the United Arab Emirates, and their operations. The killing of dozens of children and wounding of dozens more in the bombing was not itself an aberration from the daily operations of the war — which have involved the coalition targeting weddings, funerals and markets with alarming regularity. What stood out about the attack however, was the level of attention that it received in the US. Both The Washington Post and The New York Times editorialized against US involvement in the war. In a move that may be unprecedented, CNN not only covered the atrocity extensively, but also reported on the US weapons manufacturers who made the bombs for that and other attacks. ……..
5 Oct 18, WASHINGTON – U.S. Senator Dean Heller (R-NV) is today demanding additional information from the U.S. Department of Energy (DOE) regarding any potential changes to the classification of “high-level radioactive waste” so as to ensure that the reclassification will not warrant storage of any type of nuclear waste in the State of Nevada. On Thursday of this week, DOE announced that it had opened a 60-day comment period in an effort to interpret the term “high-level radioactive waste,” which, at this time, encapsulates all waste that has been created as a byproduct of used nuclear fuel. “As Nevada’s senior Senator and the person whose leadership has stopped Yucca Mountain from getting the green light, it is important that I ensure your Department’s proposed redefinition of high-level nuclear waste is not part of a larger ploy to defeat the will of Congress and the clear and consistent opposition of the State of Nevada,” wrote Heller. “As someone who has worked repeatedly with the Senate Appropriations Committee, the Senate Armed Services Committee, and Senate leadership to ensure that not a single dollar goes toward funding the failed Yucca Mountain project, I am troubled by any action, such as the reclassification of high-level nuclear waste, that could potentially be undertaken to disrupt or circumvent the restrictions on Yucca Mountain that I marshaled into law. New delay in sight for Flamanville EPR. Flamanville (Channel). In a note sent to EDF and made public on 3 October, the president of the Nuclear Safety Authority (ASN) has severely reframed the public electrician, worrying about a “monitoring failure” on the Normandy nuclear site . have corresponded to the “high quality” standard, which is more demanding. by EDF, or even the regulations required for pressurized nuclear equipment. weld represents at least eight additional weeks of work.